Home beach college college days friends ilocos ilocos norte ilocos sur pictorials picture picture story Picture Story 2: "Sunset Beach"
I like to share with you this picture. 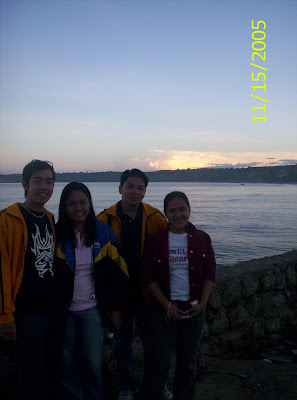 It was taken on November 16, 2006. Together with my friends, we took photos besides the beach during the sunset. Yup, this was a beach in Ilocos Norte during our field trip. We were already in the 5TH Year College finishing our course BSECE. Hayz...it's nice to reminisce the good days together with your friends. Good friends in a good view! But my question now goes: Two of these people beside me were really my closest besfriends except for the other one. Can you point out which of the three were my 2 close friends and point out also which 1 is NOT? The second from left. The one who's right beside you... Bien & Regina are your closest friends right? Tama sina Bien at Regina. Pero hindi 'ung "right beside me" kasi c Regina 'yung katabi ko na 'yun! Ung nasa dulong girl na naka-red jacket, sya 'ung hindi!! Ah OK. Kamukha kasi ni regina ung nasa dulong kanan eh. ung katabi mo pala talaga si regina. Nice! Naka-lugay pala sya kaya di ko napansin. hehehe! Ung pic nyo s bacolod wala akong natanggap. Pa-send po ulit. Thanks!